“Roma” is Academy Award-winning director Alfonso Cuaron’s follow-up to 2013’s “Gravity”. It’s dramatically different in scope as that space epic, though just as visually stunning. (And there’s a fun moment in “Roma” when characters are watching a movie in which an astronaut is trying to save another as they’re falling towards Earth. Cuaron has had a fascination with space from an early age). There isn’t a moment in the movie (presented in stirring black-and-white) that doesn’t feel real. There is utmost care taken in every line of dialogue and every shot. 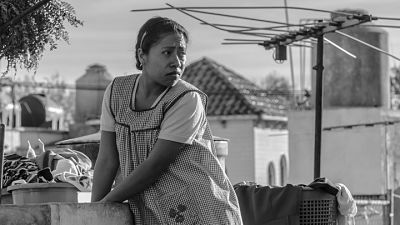 “Roma” centers around a young housekeeper working and living in the Colonia Roma district of Mexico City in 1970. The family she works for is on the brink of collapse. Cleo (played by Yalitza Aparicio) is trying to hold them all together, while dealing with her own issues and the societal revolution that surrounds them. Cuaron gradually unravels every element of “Roma” – both narratively and visually. He takes his time with the camera. From the symbolic opening credits close-up of courtyard tiles, to the vast, closing credits shot of a hopeful future, the director masterfully presents his entire story. However, at no point during “Roma” did I find myself emotionally enthralled. This is, essentially, a slice of life saga that, until a few key scenes in the final act, doesn’t provide any much needed dramatic impact. Everything simply happens. We are certainly with Cleo the entire time. Aparicio, in her debut role, gives a moving performance. But any deeper significance – other than Cuaron’s autobiographical intentions – isn’t present. There’s a series of symbolically evident events (no spoilers here), but they all point back to the same, overall theme. And that’s OK. Not every film, even ones from very talented filmmakers, needs to contain deep, meaningful messages. Often, what’s on the screen is enough. “Roma” is a gentle, culturally-interesting family drama. Nothing more, nothing less. On The Official LCJ Report Card, “Roma” gets a B.